Yeah it's been quiet around here. The two people that read this thing have given me grief for not updating it. So I'll stomp on some crickets to idle their chirping and give a brief update on what's been happening. -Parker is still walking. He's learned how to ring a cowbell and yell "Go Go". And he is still pimping the IF Jersey at the races. -Speaking of races, I've podiumed in the last 3 I've done. A 2nd, 3rd and 5th place. Wait, is 5th place a podium position, you may ask... Yes it is, when it's a MABRA race. They go 5 places deep and that was also the first time I've podiumed at a MABRA race. It was the Tacchino Cross in Leesburg. The 2nd place was in Richmond at the Ciclismo event promoted by Matt M. He beat me the day before at the Chimborazo race to take 2nd and leave me in 3rd. Nice Job Matt. -Speaking of Richmond, we spent the weekend with Coach Jeff and Heather, thanks for the hospitality. We had a great time. Bandit was relegated to his kennel. Poor guy. Jeff will be coaching Harlan this upcoming year, they'll do great things together. -Speaking of Harlan, he, Jeff, and myself represented IF racing at the Independent Fabrication World Tour event in Leesburg Virginia. Matt B came down from Boston and gave a lecture on IF bikes and the custom bike process at Plum Grove Cyclery. There were 52 IF bikes at the shop, a mix of steel, ti, road, mtn, cx bikes exhibiting the incredible range of paint options available. The following morning the shop hosted a ride on the back roads of Loudon County, which I heard are sweet. I missed it since I was racing in Richmond. -Speaking of Racing, the next race on the schedule is the Virginia State Championship in VA Beach next weekend. We are looking forward to spending the weekend with my Aunt Jean and racing with my 757 peeps. No racing this weekend, Holly has a rake with my name on it. that's about it, other than the normal wake, work, ride, repeat daily schedule. Not a good showing today. The legs never found the punch that the course in Catharpin required. No energy. It was probably not a good idea to get a flu shot on a Friday before a Saturday race. Nausea and a general sense of malaise washed over me once the race was completed. Holly commented that she knew something was wrong when I wasn't smiling during the race, while I knew something was up when I was shot out of the back like yesterday's burrito on the first lap. Patrick rode a smooth race once again, it's time for the 'kid' to step up to the C or maybe even the B category to work on riding a more contested race. He is only going to get better. Nice Job to Haymarket Bicycles for promoting a great race. That's it, going to bed to get a bit of rest for the Cobbleston Cross race tomorrow. First shot, Sat: Corkscrew Cross, short course around 3:00 to 3:30 minute laps, I think we (master's) ended up doing 13 laps... I came in 3rd all alone. Basically a dirt crit with one set of narrowly spaced barriers that wove around a vineyard. I stuck around to watch Patrick run away with the Junior race. Nice jobbie job Rook... And Annette in the Women's B, nice job on stepping back into the race series after the knee issue. Second shot Sun: Urban Cross, helluva course at the IX complex. Lot of technical features, off camber, run ups, barriers and a sand pit (10'x40'x10" of fresh sand). Fun, Fun and Fun. Legs were a bit cooked from saturday but I stayed around 3rd for most of the race until Mr Revere and Mr singlespeed in a SBC jersey came around me with 2 laps to go. I made it back around Mr Singlespeed and rode Mr Revere's wheel on the last lap. Got caught behind a lapped rider on the chicane section in the parking lot and tried in vane to make it around Mr Revere in the finishing straight, just not enough real estate to make the pass, so I ended up 4th. James had Stella's for me on ice, ah belgium beer for a belgium sport. Hung out with the family and caught up with my racing friends some old and some new. Patrick kept up the pressure and won the Juniors for a second time. Annette and James both rode well as we knew they would. Not sure where Andy finished, kinda tough for a roadie on this course. Parker and I met Mandy of Vanderkitten fame after her Women's A win. Nice Job on the win and Parker still wants your sunglasses. Third shot, Sun evening: Holly and I went on a mountain bike date while my mom watched Parker. We rode from home to Staunton's Secret Stash of Singletrack. Holly did well and we both had fun. 2 cx races and one mountain bike ride, a three shot weekend. Can it get any better??? The weather finally turned cool so I'll be squeezing myself into the skinsuit, aka the sausage casing. It's finally feeling like 'cross season. CX races in 88 degrees is not fun. Tomorrow's race is at a new venue while Sunday's race is back again at the IX building albeit without the rain and mud of last year. darn. If you're out this weekend look for the fat guy in the green skinsuit, that'll be me. Well Parker didn't win the Velonews photo contest. A crash photo won. oh well. Thanks to everyone who voted for him. Big weekend coming up, on Saturday it's the UVA Homecoming game versus Connecticut. This follows the first race of the Virginia Cyclocross Series in Louisa. Luckily the game is at 3:30, which gives me plenty of time to race (at 10am) then make it back to the valley to catch a ride to Scott Stadium. No tailgating though. That will have to wait for the Wake Forest game. On Sunday the second race of the VACX series takes place at Blue Wheel's IX Building, aka Urban Cross. Again, I'm racing at 10am but I won't have to rush off after my race. I'll stick around and drink James' beer, while I cheer and ring the cowbell for him, Patrick, his brother Andrew and Annette. I'll try to cheer for Billy as well but his race starts one minute after mine so I may have some trouble racing and ringing a cowbell for him. Best of luck to my 757 peeps at Iron Cross. 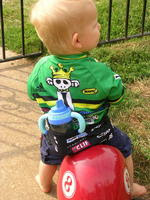 Parker made this week's Velonews Gallery. Let Velonews know how much you like Parker's picture and that it should be this week's winner, send an email to Rosters@InsideInc.com. Shawn invited me to c'ville to partake in the Brownie Crit, a weekly mtn bike 'race'. Since this is a rest week, I said yeah and loaded the ti Deluxe for the trip to the farm. Seeing how I haven't ridden the deluxe in almost two months, I should have taken a bit of interest in tire pressure / age of the stans in the tire. About 150 meters into the preride, I burp the front tire and roll it off the rim. (fall #1) Thanks to James for letting me have some stans and the use of his floor pump. Fixed and off to preride, at least some of the trail. Ride around the trail with Shawn, Dave, Jason and others was fun, although the tight switchbacks at the end of the course bit me (fall #2). Light was mounted and the race begun. I rode within myself, taking it easy, never approaching the 'red'. no falls, whew. Tight, more Tight and Twisty trails. The course is the same as the Paranormal race coming up in a few weeks. I completed the lap in around 39 minutes, nothing stellar but that's ok, just looking to reacquant myself with mtn biking. Riding back to the car, I'm riding wheelies, having fun and the next thing I know, I'm flat on my back with my bike above me with my feet still clicked into the pedals (fall #3). The ti Deluxe was punishing me for neglecting it. I know it. My guess is, it's jealous of all the time I've been spending with the Planet Cross. It has to understand that 'cross racing demands specification. Once the last 'cross race the ti Deluxe will get all the attention it deserves. from Ed Sander race between myself and Mark from HVB team was captured by Dennis Smith, photographer extraordinaire. Go HERE for the sprint, then click the 'next' for the series of photos. In the second image the tubular explodes off of the rear rim. This race didn't go as well as I had planned. I had a third row call up but botched the start when I didn't punch it as I should have on the prologue section. I didn't have the aggressiveness that I normally have and a few riders came around me before the first barriers. At the barrier someone stacked it up in front of me and went down, I dismounted and tried to go around him, but he stood up at the wrong time. My crank/pedal jammed into his back and I'm sure he'll have a nice bruise. Unfortunately, this dropped my chain and I had to stop and throw it back on. Not a good start. The rest of the race was spent reeling in riders and staying smooth. I was passed by some and pulled a few riders back. The Pond section of the course with the 90deg. turns was where I made up the most time. I would lose time on the road section. Just like Charm City I would make up time in the technical sections but cede it back on the power sections. Not sure who it was, maybe FatMarc, but someone yelled for me to catch and pass a HVB rider on the last lap. I nodded and took off after him in the road section. I could see that his head was dropped and I made sure I was in front of him before the run up section at the far side of the course. I held him off going up the last hill and descended down the off camber hill. I was still ahead of him at the gravel pit right before the finish and held him off at the line as his rear tubular rolled off the rim. Quite an exciting finish even if it was for 20th place. I heard a lot of people cheering for me and Holly even remarked that she heard them cheering for me. My Peoples... Thank You. Parker was sporting his IF jersey and was spreading lots of Indy Fab Love. Andrew McK didn't ride with us to the race, I guess he'd rather hang out with Jeremiah than Parker... Andrew had a solid race, but may need to work on the remounts. Patrick McK also had a solid race and took 2nd (even though the results show 3rd erroneously) in the Mabra Junior race. Nice Job at your first 'cross race. Chris N won the 35+ B race but couldn't stay for the podium since he has a 1 month old at home. Parker's Jogger filled in for Chris on at the top of the podium. Great win Chris. We stayed for the Elite race and rang the cowbell for Jeremiah. Go JB!! On the ride home my throat started to hurt, and by the time we were in Winchester, it was on fire. This led to a nice Head Cold in time for Sunday Night Football. Luckily, this is a rest week and next weekend is open. I should be back in time for the start of the VA series.